For a 10 to 12-inch pan, go for 6 eggs. You can add whatever you hand on hand. Asparagus, leeks, bacon, various cheeses, potato, and so on, just keep the toppings to around 1 to 2 cups. 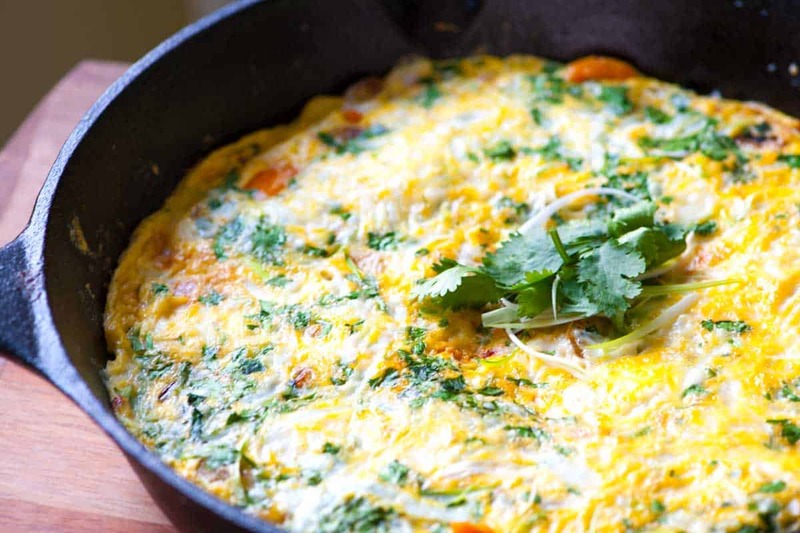 In a medium bowl, whisk the eggs, cheese, chipotles, scallion, cilantro and salt together. Heat a 10 to 12-inch cast iron skillet or oven safe, non-stick frying pan over medium high heat. Add butter to pan and melt. Add potato and cook for 3 to 4 minutes or until tender. Add the bell pepper and cook for another 2 to 3 minutes. Position an oven rack towards the top of the oven and heat oven to broil. Pour egg mixture into pan and stir with rubber spatula. Cook for 4 to 5 minutes or until the egg mixture has set on the bottom and begins to set on top. Slide the pan into the oven and broil until lightly browned and fluffy on top, 2 to 3 minutes. Remove from pan and cut into 6 wedges.